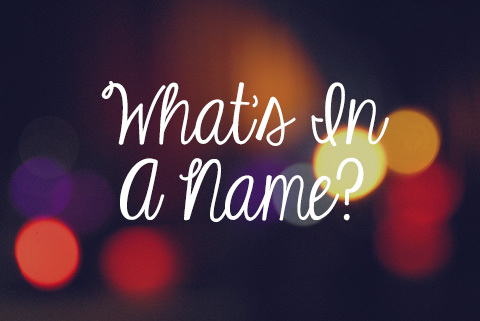 There is a lot in a name. A name holds the essence of the person, said the ancient philosophers, and can affect many things. A name can evoke fear: “Fear of a name only increases fear of the thing itself” (Hermione Granger, Harry Potter & the Sorcerer’s Stone). A name can evoke feelings of pride or honor: “She was the bravest person I ever knew” (Atticus Finch, To Kill a Mockingbird). A name identifies us: “The virgin will conceive and give birth to a son, and they will call him ‘Immanuel’ (which means ‘God with us’)” (Matthew 1:23). A name draws us into community within a family. The change of a name can hold significant meaning. For centuries and in countless texts, change of a name usually indicates a change in mission, in outlook, in journey; it symbolizes something that is new in the person while acknowledging all that has come before. In Scripture, Jesus changes the name of Simon, a humble fisherman disciple, to Peter because, He says, “on this rock [petrus or Peter] I will build my Church” (Matthew 16:18). The change of Peter’s name changed his mission, his outlook, his journey. He was now the rock on which the Church was to be built, all the while not forgetting who he was as a fisherman along the shores of the Sea of Galilee not long before. Jesus tells the Father that He has revealed His name to those whom He called. He reveals the name of God to the disciples, to all of us throughout the centuries who have called upon His name and have desired to follow after Him. He has revealed, in a sense, God’s very self, in revealing His name, in giving us the words that He has to give to us. What is it about this name? What is it that has made kings fall to their knees and the most raucous grow silent? What is it about the One who created the heavens and the earth, and who formed us in our mother’s womb? What is it about this name? In revealing the name of God, Jesus reveals God’s true desire: to live in relationship with us. What a beautiful thought! That the Lord of all creation, the all-powerful and ever-living God, desires us to know His NAME. He desire us to know His name that He might teach us about who He is, that we might know Him, and grow closer to Him day by day. He reveals to us His name, so that we might love Him, trust in Him, and keep His commandments. This is not found in the name of Buddha, or in the name of Mohammed, or the name of Bahaullah, but in the name of the One True God, the God of Abraham, Isaac, and Jacob, “I AM WHO AM,” the Creator of the world. The Lord of all creation reveals His name to us. In our modern day, it is hard for us to reveal even the most minute piece of ourselves to anyone else, for fear of judgment, condemnation, to be labelled as a “fanatic,” a “liberal,” a “conservative,” a “broken person,” “unworthy.” In the midst of this, Jesus reveals to us the most intimate thing about God that He can, His name. Let us this day open ourselves to the Father, who reveals His name to us, that we might draw closer to Him. Let us show Him all that we are, all of our sins and failures, and let us allow Him to heal us, to cleanse us, to raise us up to live and love in His name. I am scared of revealing myself. I am worried that if I let a piece of myself be seen and known, that I might be ridiculed or that I might be hurt. Father, help me to open up to You, who have revealed Your name, Your very self, to me. Help me to enter into relationship with You, to love You, and to glory in Your presence. Then, help me to draw closer to others that I might join them in the saving work of the Gospel mission.